Since the inception of our company in April 2016 our mission is and has been to use interactive technology to bring people together. We’re dedicated to advancing awareness of interactivity to the public. Since then we’ve gained a massive amount of support from Denver city government and industry leaders. In order for us to achieve this we’ve made a key focus of becoming part of the creative tech community both in Denver and outside, gathering as much knowledge and insight as we can to boost our abilities and ultimately enhance Denver. 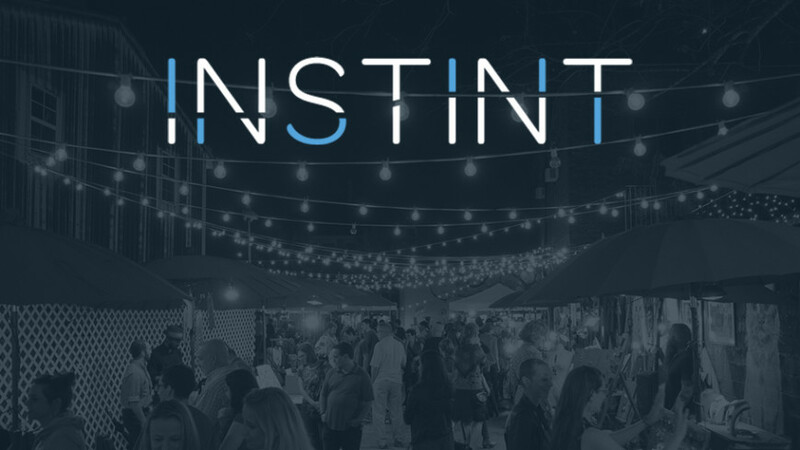 In January Paul Elsberg – CSE Chief Sales Engineer / Creative Developer attended New Orleans’ INST-INT conference, an annual gathering of interactive technological exhibitions showcasing practical creative applications drawing together diverse groups of people; In other words, right in our wheelhouse. INST-INT is a one of a kind, world renowned annual conference which draws in eclectic A-list interactivity pros and attendees with exhibits of Installation & Interactive Art, Experience Design, Responsive Environments & Objects, Interactive Exhibits & Displays, Creative Coding, DIY Making & Hacking, Architecture & Technology, Sensors & Wearables. 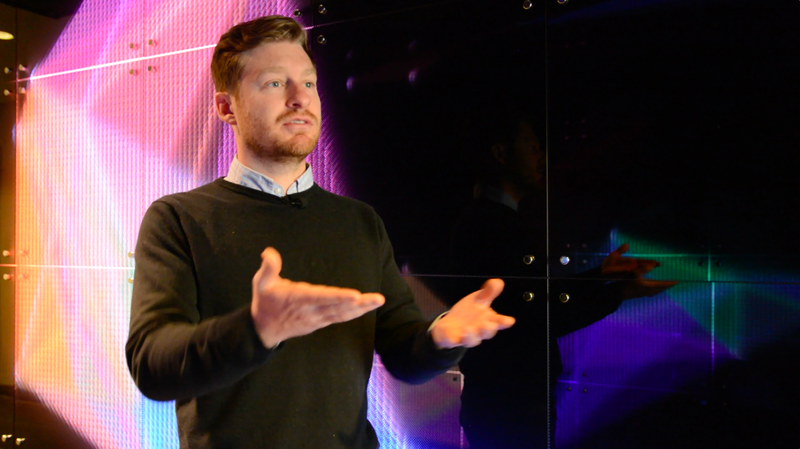 Matt Maes – CIO Chief Influence Officer / 3D Generalist previously participated in MIT’s “Reality, Virtually, Hackathon!” which according to Network World’s Steven Patterson set a record for the largest VR/AR hackathon. He later continued his game development experience in the Global Game Jam hackathon, an open competition organized across the globe with a focus on bringing gamers together to create work which engages them to act as part of a team. Maes has also been extended the opportunity to speak on the VR/AR panel at GlobalMindED conference in June. GlobalMindED is a nonprofit organization focused on increasing the success rate of first generation college students, connecting graduates and employers. 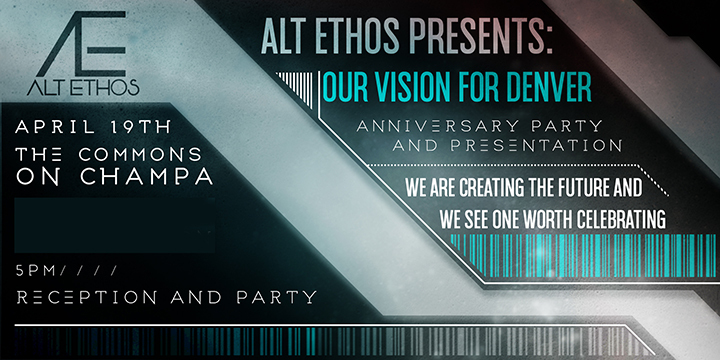 On April 19th at the Commons on Champa we’ll be presenting Our Vision for Denver and celebrating our One-Year Anniversary as a company. Our CEO Ethan Bach will be speaking on our vision for the future of Denver as an international hub for innovative experiences with media in the physical realm. We’ve lived, worked in and experienced Denver for years and now our plan is to use this technology in collaboration with government and industry leaders to establish Denver as a mecca for creative, connected experiences. Bach has experienced a fascinating journey within immersive media, art, activism and ultimately bringing his knowledge and experience as CEO of Alt Ethos. After the presentation we’ll be celebrating our one-year anniversary with drinks, hor d’ouvres and the unveiling of our interactive LED wall located at the end of the hallway leading to the Event Space. Our installation utilizes Kinect sensors to synchronize with your movement patterns, mirroring a variety of positional effects on opposite LED screens in real-time. Customer Experience is the future of design. Adopting practices that elevate the customer experience will undoubtedly produce a return on investment and provide a steady foundation for your brand. Experiential Design activates chemicals in the brain: Dopamine, oxytocin, serotonin, and endorphins; These increase happiness, productivity, and customer loyalty. Millennials spend $3.3 billion annually in Colorado. $2.2 billion annually in Denver alone. Over the past two years our company has had the privilege of working out of the Commons on Champa, downtown Denver’s small business entrepreneurial hub. For all of the recent positive signs our current success wouldn’t be possible without their support. The Commons on Champa represents a partnership between the Downtown Denver Partnership, Colorado Technology Association and the city of Denver. 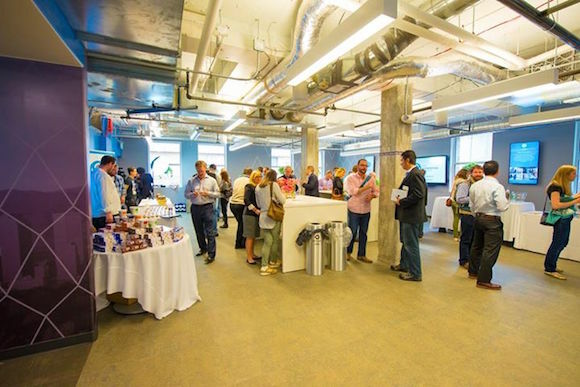 The Commons parallels the openness given by its name in its practices by providing resources and workshops to holding high tier events, stapling its name as Denver’s most openly centralized habitation space for Denver’s future entrepreneurial leaders. We’ve taken in a great amount of insight and support from mentors and other key influencers into what it means to connect progressive minds together. We’d like to shine a spotlight on their work and share words from the man who runs daily operations, Jesse Shuler. Jesse Shuler – Building Coordinator manages the Commons day-to-day operations with a keen mind and a light heart. Jacqui Dietrich – Program Manager lends her entrepreneurial insight into functions which staple the Commons as an environment which fosters small business growth. Together they’ve allowed a solid place for us to excel, developing a close relationship with us along the way. The Commons was established and aims to “Act as a blueprint that anybody can use. The mission is wholeheartedly to authentically create a hub which showcases Denver’s commitment to the entrepreneurial community.” – Spot on statements on a remarkable space. We asked for his insight on what blend of skills best dictates success in our industry and for entrepreneurs as a whole: “A skill that is very important is to pay attention to what the market is demanding. Take your skill set, your knowledge, your expertise and supply what the market needs. If you’re able to be flexible and pivot and think big I think that’s a huge need especially for folks in Experiential Design. Thank you Jesse and all at the Commons. Here’s to many successful times ahead.